As part of my ISATEC Master Program of the University of Bremen and the Center of Tropical Marine Ecology I am currently living on Fiji to collect my fieldwork data. 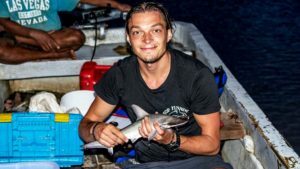 The University of the South Pacific is working to develop and propose a national management plan for the endangered scalloped hammerhead shark and my findings here will contribute to the necessary data collection. 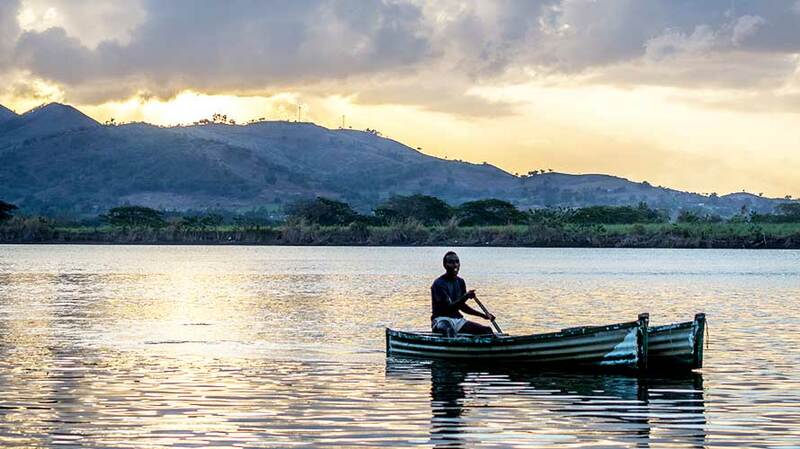 I am investigating an estuary in northern Viti Levu, Fiji’s main island. Among many other species, hammerhead sharks are encountered all around the more than 333 islands of the Republic of Fiji and yet, there is not much known about areas utilized by juvenile sharks. I intend to collect data that might indicate a potential nursery ground of shark pups. As per definition I will not be able to finally prove the nursery concept after Heupel et al. (2009) but my study can be repeated over the coming years to prove side fidelity and usage across years. Hammerheads utilize – like many other shark species – mangrove-fringed coastal areas as nursery grounds. Similar to turtles, grown females are believed to show a high degree of philopatry, meaning they return to the same areas over and over again to give birth to their pups. This makes it especially important to identify these areas and protect them on the longterm. I am using a 100m long and 3m wide gillnet as well as a 75m longline, with almost 30 baited hooks. The gillnets are checked in 20min intervals to facilitate tagging and releasing, whereas the longline is being checked in 40min intervals. 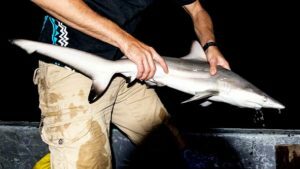 Caught sharks are sexed, measured, identified for species and tagged with a so-called PIT tag (Passive Integrated Transponder). If caught again, this individual tag allows me to determine when and where the animal has been caught before. After two to three minutes of processing the sharks are being release back into the waters of the Pacific and may continue living their life. After spending the first couple of weeks in Suva, learning the methodology and organizing all the required equipment I am now I the middle of the fieldwork collection phase. During most weeks I am living in the village to go out at night and “fish” for sharks, whereas I usually spend the weekends back in Fiji’s capital Suva, a five hours drive from the village. With my very experienced captain David and my two helpers Sione and Jim, I have a great team that helps me with my fieldwork. Usually we start fishing as the sun sets (sharks are believed to be more active at that time, increasing the probability of catching them) and continue until 1am or 2am in the morning. In addition to the shark specific data, I am also collecting abiotic parameters like salinity, dissolved oxygen and surface temperature. By now we have caught and tagged over a hundred juvenile sharks. Around 70% of that are Blacktip sharks (probably C. limbatus), 20% are scalloped hammerhead sharks (S. lewini) and the rest consist of the Great hammerhead (S. mokarran – an absolutely beautiful shark!). The next weeks will show whether this trend will continue or not. It is believed that the parturition time of many shark species around this area here is around November/December and reaching up until February/March. Seeing that most of the sharks I caught during the time have an open umbilical scar, my findings seem to confirm that assumption. During me free time I try to dive as often as I can to emerge into the world of sharks and capture them in their natural environment. At the moment I am taking photos with My Nikon D7100 and a Tokina 11-166mm 2.8 wide angle lens in a Sechura BS Kinetics Housing. To light them properly even in 30m depth I additionally use two Inon Z240 strobes. By now I have dived more than two dozen dives with my new housing and really like the handling of it! Before closing the housing, I make sure to switch to the M-mode and set my shutter speed to 1/200 of a second with my flash turned on, and my aperture to around 8. I also switch off the ISO Automatic and set it to around 200, adjusting that setting once in the water to me desired brightness of the images. Keep in mind though, that changing the settings can be a very challenging task if you have around 40 or fifty feisty Bull sharks swimming around you. The shark dive here in the Beqa channel has reached a world-famous reputation with up to eight different shark species on one single dive! Most of them are mature Bull sharks reaching length of up to 3,5m.Experienced local feeders hand- and bin-feed the sharks, all in very controlled and safe manner. 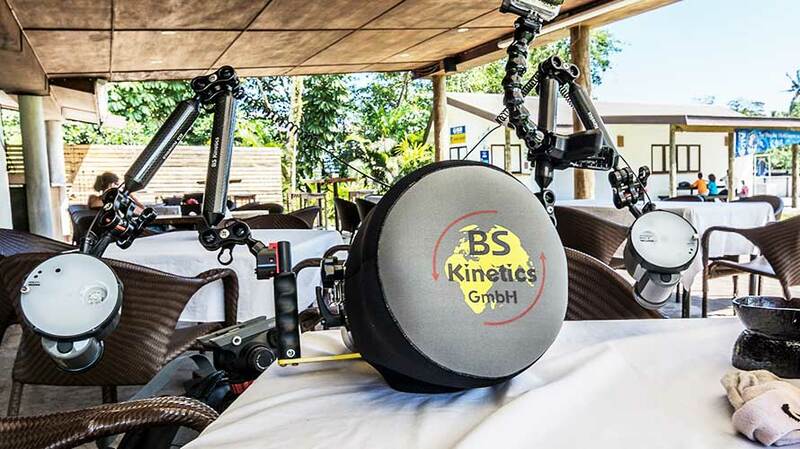 These dives have evolved over a period of twenty years and have continuously been optimized. Shark dives are ambivalently discussed by many specialists around the world, as many of the potential consequences are still unknown. For example, several studies have shown that long-term feeding operations my alter the species composition at specific feeding sites. 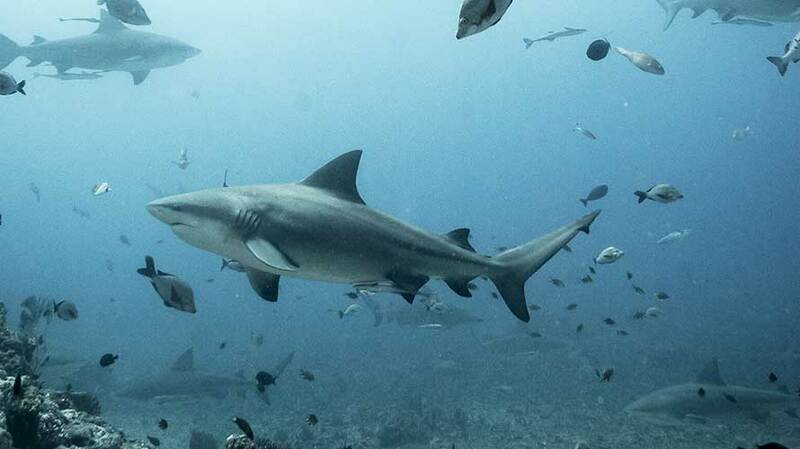 Here in Fiji, in the Shark Reef Marine Reserve, the abundance of Bull Sharks has increased sevenfold within seven years, whereas numbers of smaller sharks gradually decreased. On the other they dive operators managed to declare Fiji’s first national Marine Park after more than ten years of campaigning and advertising its benefits. Today, every diver is paying a levy, which is divided among the villages owing the traditional fishing rights to the particular area and in turn these villages refrain from fishing there. This has benefitted not only the sharks but all other marine life here. Additionally, almost every diving leaving this dive is going as a “shark-fan”, advocating their beauty and their grace and especially their need to be protected. In times of massive overfishing, habitat destruction and ocean pollution, sharks have a very hard time surviving and in my opinion potential small-scale changes can be neglected in face of all the above mentioned threats. As long as the positives are overweighing the negatives and under the assumption of the compliance with very high standards, shark dives have the potential to create an economic interest inn sharks other than fishing, they can create local workspaces and shark conservation can be pushed further. In the end it is all about knowledge transfer to the base of all societies: it’s people. Eventually everyone has to decide for themselves, whether he or she wants to support such dives or not. Sharks need our protection that is a fact. 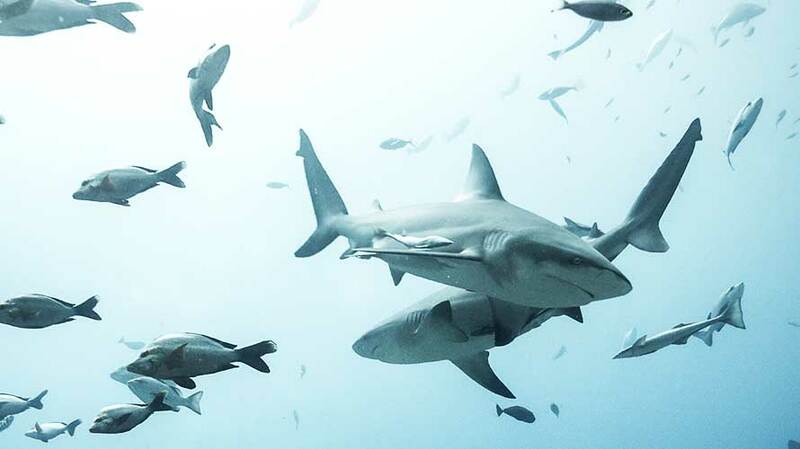 An estimated hundred Million sharks are being killed every year, a large art of that for the shark fin trade in Asia. They may the main attraction for many divers around us, but are usually portrait as mindless killing machines by the media. “Only” around ten people per year die on average due to shark attack. If you bear in mind that more people are killed by crocodile, hippos, falling coconuts or even vending machines our hysteria seems insane and inappropriate. By avoiding all kinds of shark products and spreading information on the complexity of these animals, everyone can help to make a contribution. Donating money to one of the countless shark conservation organization is also a very good idea and can help in the fight for the protection of these diverse group of animals. For the sake of all coming generations, I sincerely hope we will find a way to live alongside sharks and preserve them. Our oceans need them to function and if we keep removing too many of them, we disturb the natural balance of many ecosystems. We as humans shouldn’t be afraid of sharks, but rather of an ocean without sharks! 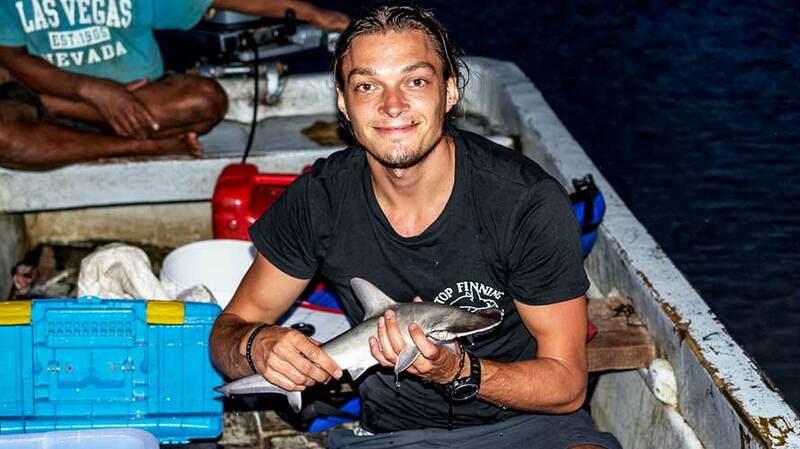 Tom is a shark scientist in training and is currently based on Fiji to investigate potential nursery areas of hammerhead sharks. He founded livingdreams.tv in 2013 to show his photos, report on his work and journeys and spread the conservation word. He’s spent the last years studying & photographing the world and hopes to encourage a more sustainable way of life. You can follow him on facebook , twitter or instagram.